Pick-up sticks. You know the game. 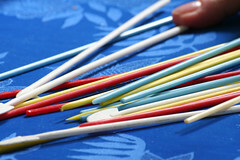 You drop 33 colored sticks in a pile and take turns trying to pick them up, one at a time, without disturbing any of the other sticks in the process. If you pick-up a stick successfully, you get another turn. sticks (40 points) that were easier to grab. Their strategy was simple and effective: go after the big fish first; get those blue and black sticks; score the most points; win! Neither of my sons is a genius, yet both of them understand intuitively that victory depends upon snagging the scarce blue and black sticks first. emails, meetings, and calls that are made the rest of the day! achievement hinges on identifying and “picking-up” the blue and black sticks on your next action list, not putting them off until another day in favor of the busy-trap’s yellows and reds.